UPDATE: I now have appointments with the dermatologist to remove the lesions and with the plastic surgeon for skin grafts on December 24 and 26. Yay! Right after my third baby was born, when I was still recovering from a long labor and not quite back to myself, I received an advertising postcard from a local plastic surgeon, whose name I have mercifully forgotten, suggesting that this would be a perfect time for a facelift. As I recall, the message had just a bit of an ominous tone about how marriages are vulnerable during this time because of the toll pregnancy and childbirth take on “gals.” This was one of those occasions when I considered the real value of a 5-day waiting period before one can buy a handgun. I’m very comfortable in my own skin, though I'm a rather shy person and have always been self-conscious. If I were a male songbird, I'd be like the chickadee singing from within the branches, so others could hear but not see me, rather than the mockingbird singing on the pinnacle of a tree and doing amazing loop-the-loops in flight, flaring out conspicuous wing patches as I sang to draw everyone's eyes as well as ears to myself. Like most birds, I spend as little time around mirrors as possible, but haven't minded getting older. Indeed, I feel darned lucky to be 62 years old--my life has already lasted 12 years longer than my father's did, and 9 years longer than my little sister's. I’m perfectly comfortable doing radio, as long as no one is watching me do the recording—that’s why I was so motivated to learn to do my own sound editing when I started doing “For the Birds,” and why I started recording at home the moment I figured out how to do all my production work digitally. 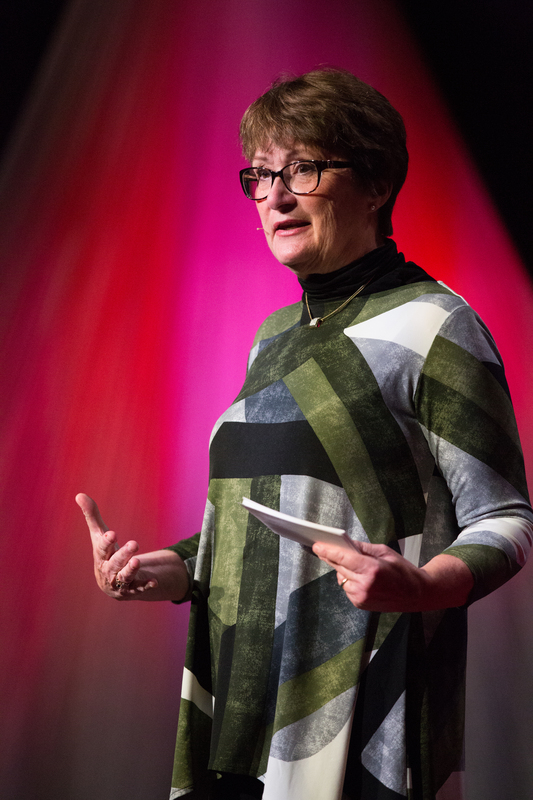 Back in the 1980s and early 90s when I’d be invited to speak in front of people, I often couldn’t get a single word out until the slide projector was on, the lights were out, and I was safely situated in the back of the room. It wasn't that I didn't like how I looked—I was just very self conscious about speaking in public. It would have taken way more than a mass-mailing postcard to get me to a plastic surgeon. I can understand why people whose appearance is an essential part of their careers turn to surgery and Botox procedures and such, but that hardly seems in order for me, and billboards, TV commercials, and postcards on behalf of physicians designed to make people, perhaps especially post-partum women, feel inadequate and embarrassed about their appearance seem both tawdry and unethical. who just gave the chick a mealworm. I always figured people would be happier if we were more like birds. 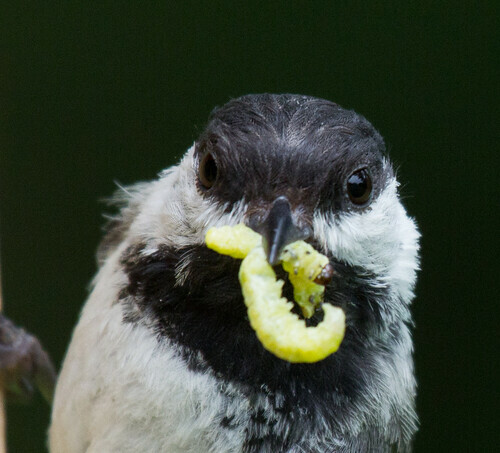 For example, a few summers ago, I took photos of a male chickadee at the end of his season of raising babies. 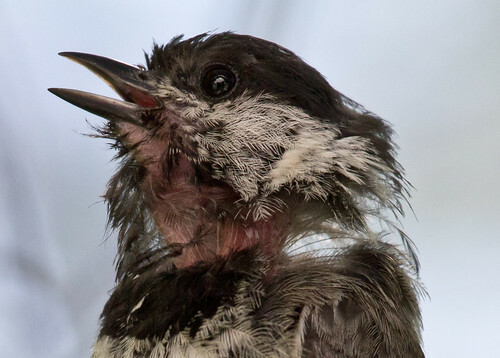 All parent chickadees look messed up at that point, but he looked especially bedraggled—several people who saw the photos thought he was at death’s door. But ironically, the photo that seems to show him at his very worst was taken while he was in full song, belting out his "Hey, sweetie!" 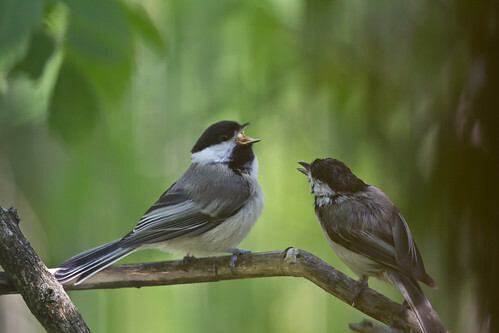 without a trace of self consciousness, making sure his young all learned exactly how a virile male chickadee is supposed to sound. Beauty is as beauty does, and he would be in top form the following spring to raise a new batch of healthy young. I’ve been thinking about superficial beauty for the past few weeks, since I had a speaking engagement in Rochester. A couple of people approached me after my talk to tell me I should get a spot on my face checked out. I’d already had my doctor check that very spot a few months ago, when it looked more like rosacea than cancer, and I felt embarrassed that my talk hadn’t been compelling enough to keep everyone’s attention on birds rather than my face, but I figured I might as well go back to the doctor. She biopsied the conspicuous spot and one hidden on my forehead, and sure enough, they’re both basal cell carcinomas—the least dangerous form of skin cancer, but cancer nonetheless. So I was referred to the dermatology department at our medical provider. When I called them, they put me on hold for about 15 minutes, and then when I did get through, they could not connect me to the appointment desk and told me they’d get back to me in “two to three weeks.” When I do finally reach the appointment desk sometime before the Christmas Bird Count, the appointment they finally set up will not take place until spring migration kicks in. If only I’d wanted a facelift or Botox and didn’t depend on insurance, I’d be in and out quickly, assuming I survived, and soon people could be ridiculing my face job as they feel free to do with any self-conscious Hollywood actress who's had work done. 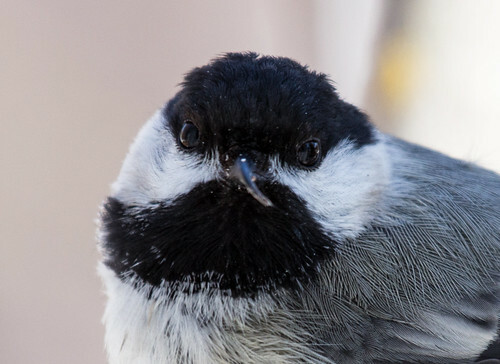 Imagine explaining cosmetic procedures to a chickadee, or any other bird. Birds of both sexes tend to judge potential mates by age and experience—the older and more experienced, the better. In species that have physical changes indicating increasing age, potential mates are virtually always drawn to the older, rather than the younger, bird because all those life experiences point to success in the things that really matter. 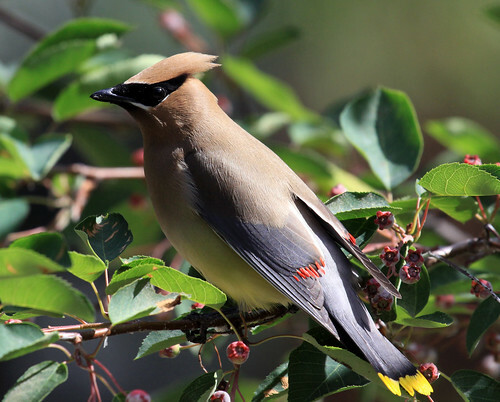 Waxwings grow more of those red spots on their secondary wing feathers as they get older. 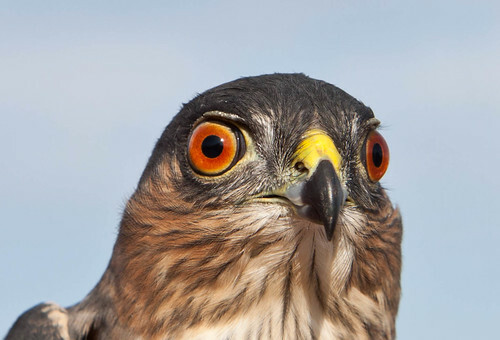 Accipiter hawks develop a redder eye as they age. 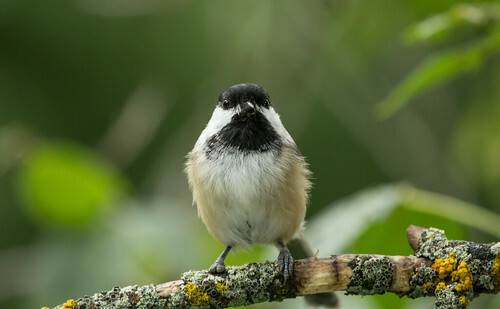 Male chickadees work their way up the flock hierarchy rather steadily as they grow older and more experienced, the feathers on their cap and bib growing in increasingly black, and those on the cheek whiter, showing off each bird’s age as a badge of honor, not something to cover up with plastic surgery or dermatological procedures. As bedraggled as my male looked at the end of his child-rearing responsibilities for the year, his attractiveness to females was enhanced, not harmed. The chickadee visiting my feeder last winter with the deformed bill never did succeed in nesting this year—it was having enough trouble obtaining and eating food for itself with such an elongated bill, and would have had even more trouble feeding young. I suspect it was old enough to have had a mate before the deformity developed, considering that the moment I offered it mealworms this winter it came instantly to my hand—I’d not put out mealworms since before my Big Year, so this one had to have remembered me from early in 2012. Sometime in the spring, the bizarrely elongated tip of the upper bill broke off, and now the bill looks almost normal, but that happened after the other birds in the flock were all paired off. That particular chickadee is also missing the three front toes on the right foot. If you look carefully, you can see both the bill deformity and the missing toes. It seems that that may have been a fairly recent injury, because the right side of its head often looked somewhat poorly groomed, and in the winter and spring it didn’t always seem to be holding on securely to branches. Months later, it seems much steadier on its feet and is better groomed, though I can still see a bit of difference on its face, making it easy to pick out even when the feet aren’t visible. It’ll be interesting to learn whether its bill gets overgrown again this winter, the time of year when deformed bills seem to appear most in feeder birds, and also whether it will attract a mate. But if it can’t, that won’t be for looking its age. For birds and sensible mammals, every day is a triumph, not something to hide with cosmetic surgery. Meanwhile, as I wait rather impatiently for my turn to make the appointment for the procedure to remove the cancerous lesions on my face, I've been trying to figure out what the holdup is. According to an article in the Minneapolis Star Tribune from this February, there’s a huge shortage of dermatologists throughout the state. Apparently the University of Minnesota’s medical school currently graduates only about 5 new dermatologists a year, and more and more dermatologists are spending more and more of their time on unnecessary cosmetic procedures. And more and more dermatologists insist on payments by cash or credit card—many no longer accept payment via insurance, even for patients with medical needs. What some doctors are calling “entrepreneurial medicine” is exactly what I found so offensive when I got that postcard telling me I should get a facelift 30 years ago. These are the people preying on aging actors and insecure people of all ages, and limiting their medical services to people wealthy enough to pay cash. Thanks to the increase in cosmetic procedures and to competition because of the shortage of practitioners, dermatologists as a whole have seen a 50 percent increase in their incomes since 1995, while primary care physicians’ incomes have grown only 10 percent. Meanwhile, the very dermatologists who prioritize cash-paying cosmetic patients are blaming the shortage of doctors dealing with skin cancer on Medicare cutbacks that leave less money to fund the residency programs that produce more doctors, despite evidence that the current medical establishment intentionally limits the number of new doctors who would be competing with them. It’s supremely ironic that the same so-called professionals who owe their lucrative careers to the publicly financed residency system that trained them now defend the free enterprise system, even as they whine that medicine needs more public financing if we’re to have enough doctors. The entire system is poisoned. As I said, basal cell carcinoma is the least dangerous form of skin cancer, and I’m sure melanomas get much more prompt treatment. Even though the more conspicuous of my lesions grew very quickly and now I seem to be developing a third one, there's a pretty low probability that my cancers will spread far. Some people say my wait is reasonable “triage.” Of course more urgent needs should come before the least dangerous form of skin cancer. But meanwhile, if I’d wanted a Botox treatment, or a face-lift, or breast augmentation or reduction, I’d be recovering now rather than seeing cancerous lesions every time I look in the mirror. How can anyone defend a system in which someone frowning into a mirror at a few wrinkles gets top priority over that? A few friends have suggested ways I could finagle my way higher up in line, but that doesn’t seem cricket—chickadees take turns and follow a regimented procedure for waiting in line at food sources, but are of the mindset that "we're all in this together," so no cutting in line for them. If the line waiting for essential dermatological care is too long, that’s not the fault of the people ahead of me—it’s the fault of a cancerous system that keeps the number of dermatologists so much lower than what we need at a time of ever-increasing skin cancers. Every social species, from ants to chickadees, has important strategies to protect the social structure underpinning every individual's survival. Watching my own chickadees, I can easily see how even as the system rewards the fittest chickadees as individuals, every chickadee, from the highest to the lowest on the flock hierarchy, honors its flock's needs. Each chickadee squirrels away as much food as it can against future shortages, but if one chickadee's stores are wiped out, the others don't mind sharing their stores with it. We like to tout the myth of the self-made man, when it is our society—our schools and infrastructure and the people who produce our food and clothing and other needs and services and pleasures—it's our whole flock that allows individuals to thrive. Sadly, the one scale on which we humans outstrip every other animal is our species’ amazing ability to rationalize greed and selfishness and cutting in line and stepping on others to claw our way to the top. 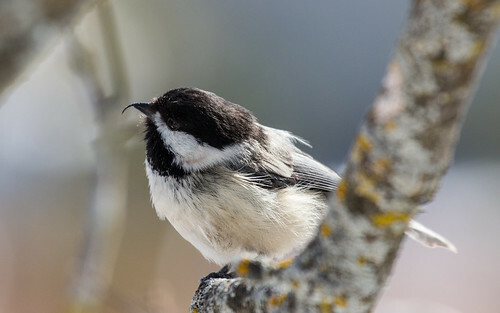 Chickadees are far, far wiser. I'd rather be like them. Please don’t comment that I need to be using sunblock. I’ve been consistently using sunblock since I was in my 20s, and I haven’t gone out without 50-SPF sunblock on my whole face and neck, plus a 30-SPF on top of that on my nose and chin, plus a hat, since I was in my early 30s. 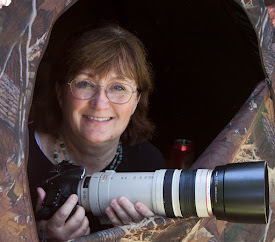 Indeed, as a birder who has spent so very many hours outdoors over the years, in the tropics and the southern US and high on mountains as well as in my northern birding haunts, not getting any skin cancers at all until I reached my 60s is evidence that my precautions have served me well. But even if I hadn’t been so conscientious, that kind of advice after the fact seems at best hollow and uncaring. I often tell people that there is little humans can do that doesn’t have an avian counterpart. People who remain devoted to their mate throughout their life are like swans, geese, and cranes. Those who tolerate each other and stick it out for the duration but take separate vacations are more like Bald Eagles. Those who flit from one one-night-stand to the next are hummingbirds. People who focus for long periods on one task are like kingfishers, who may take close to two months to excavate a single nest tunnel, or eagles that continue to work on the exact same nest for decades. Those who flit from thing to thing, never quite settling on anything, are the cowbirds who can’t build a nest at all, and lay their eggs in the nests of dozens of other birds. I’ve found bird representatives for various political persuasions, sports, hobbies, approaches to housework, and all manner of things. 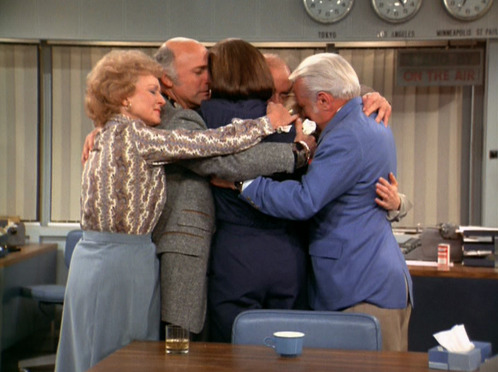 But the one thing I could never even imagine finding a bird corollary for was the iconic group hug on the last episode of The Mary Tyler Moore Show. As a handful of readers may recall, the WJM news crew, all sobbing and holding onto one another in a massive group hug, stayed in position as they shuffled over to a desk to grab some tissues. Of course no birds would ever engage in an actual group hug, and if they did, there’s no way that they’d shuffle about, arms or, actually, wings around one another, not letting go as they moved in a tight mass. That would be inconceivable, right? Apparently, my faith in the endless variability and coolness of birds is not as strong as it should be. It turns out that one kind of bird at one point in its life cycle does get into a group hug and shuffles about in a mass together just like on The Mary Tyler Moore Show. 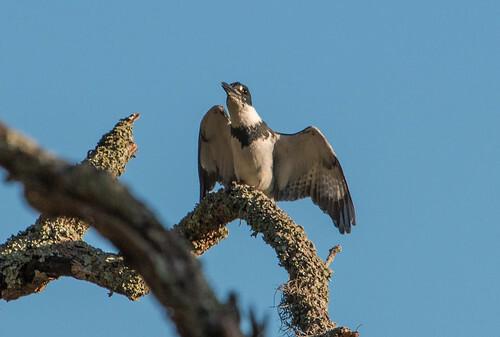 Belted Kingfisher adults are not the least bit inclined to watch TV sitcoms or engage in group hugs—indeed, they are one of the more solitary, unsociable birds around. But their nestlings do indeed wrap their wings and wide bills around one another almost exactly like Mary Tyler Moore and friends, maintaining their positions and shuffling en masse if one bird even moves its foot. ... were not only found wrapped together in the nest, but the moment they were put on the ground, one at a time, though their eyes were still sealed, they immediately covered one another with their wings and wide bills, making such a tight ball that when one shifted a leg, the whole mass would move like a single bird. In 1900, with The Mary Tyler Moore Show still 70 years in the future, Bailey couldn’t make the obvious comparison, but he already realized the sitcom possibilities, noting how comical this looked. It isn’t until the birds are almost two weeks old that some of their feathers start opening up enough to have any insulation value. He found the chicks maintained this behavior at least through that time. 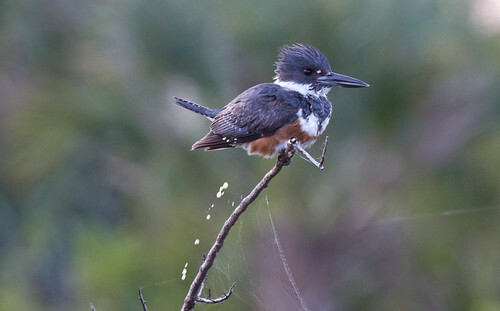 Adult kingfishers regurgitate pellets of fish scales, bones, and other indigestible materials, which accumulate in the nest, apparently making the floor more spongey and less likely to get slick and muddy after a rain, and providing better insulation as well. Messy as that may appear, reports all seem to mention how sanitary the nest chamber is as far as the chicks' excrement goes. Nestling kingfishers back up and shoot their droppings out on the floor toward the nest walls. Then they shuffle over and tap the walls, which both loosens dirt to bury the droppings and, little by little, enlarges the nest chamber to accommodate the growing young. This of course is exactly the kind of clever homemaking tip Sue Ann Nivens would approve of. Yep—there really is some kind of bird that does just about anything we people do—even on 70s sitcoms. I’ve got too many favorite birds. I don’t know how I could possibly compile a Top Ten list—there are just too many splendid birds out there. But I think one of my all-time favorites must be the Belted Kingfisher. 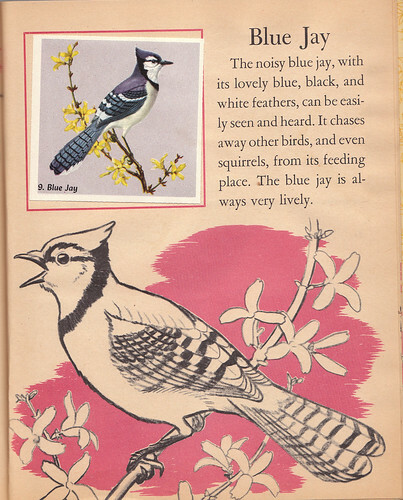 This funky looking bird—crested and blue like a jay, but with a way oversized head and bill and way undersized legs and feet, giving it an odd, top-heavy look—was one of the standouts when I was first thumbing through field guides. I must have been near kingfishers a lot in the spring of 1975, when I was out virtually every day, in appropriate habitat on the Michigan State University campus, as a brand new birder, and so I must have heard them many times before I recognized their unique rattle call. But I didn’t see my first one until I took a field ornithology class at the Kellogg Biological Station that summer. 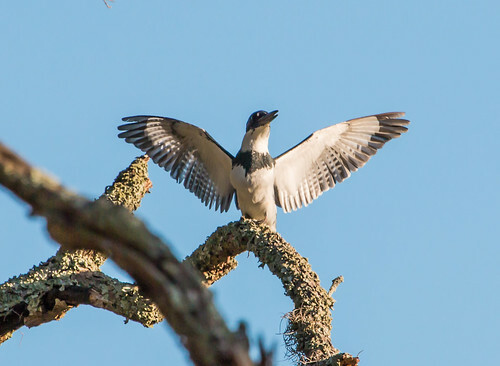 On June 30, we took a field trip to St. Timothy’s Church in Kalamazoo, Michigan, a little marsh-edged lake abutting the parking lot where our professor pointed out a gorgeous perched Belted Kingfisher—he also pointed out its rattle call several times. When I got home, I pulled out my bird record (this was in 1975, before CDs, and few bird recordings were available on cassette tape) and listened, over and over, to that thrilling call. Focusing bird by bird like that helped me develop my birding skills. Sure enough, just 2 days later I found a kingfisher all by myself, back in my original birding stomping grounds on the Michigan State campus. I don’t think it’s possible to emphasize enough that we become proficient at birding by putting in the time. Every bird we learn makes finding and recognizing that species again easier. Fun as it was to see that first kingfisher in class—it was #70 on my life list—identifying the first one I found entirely on my own was even more satisfying. Within a month or so, knowing exactly what to look and listen for, I was seeing them most of the time when I was near open ponds, lakes, rivers, or streams. One of my regular habits when I started birding was to read up on each species the night after I first saw it. I started out focusing on my two regular field guides—the Peterson and the Golden guides, but quickly discovered the Audubon Land Bird and Audubon Water Bird Guides, which provided more information than just identification. Little by little, I added many more books to my library. When I saw my first Belted Kingfisher, I read that it’s one of the few bird species in which the female is more colorful than the male—both have a bluish breast band, but adult females also have rusty undersides that narrow to form a complete band across the upper belly. 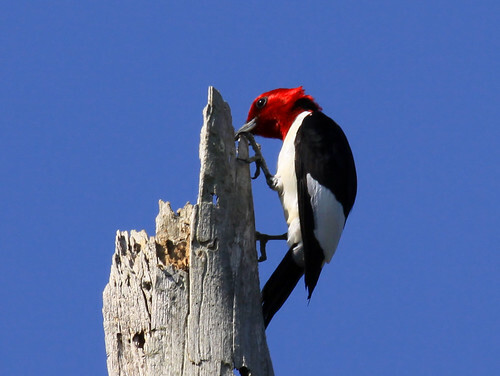 (Young birds of both sexes have red on the sides, but it doesn't form a complete band.) This isn’t the rule among kingfishers in general: of the three species regularly found in the United States, it’s the male Ringed Kingfishers that have more red, and only male Green Kingfishers have red at all. It is derived from the Greek (h)alkyon also meaning “kingfisher.” Halkyon gives rise to the phrase “halcyon days” which, in the myth, are calm days at sea, so that the floating nest of the kingfisher [out in open water on the ocean, where people once believed they nested] will not be disturbed during the brooding period. The days were kept calm by order of the gods to honor the young of Halcyone, daughter of Aeolus, God of the Wind, who, when widowed, threw herself into the sea and was transformed into a kingfisher. 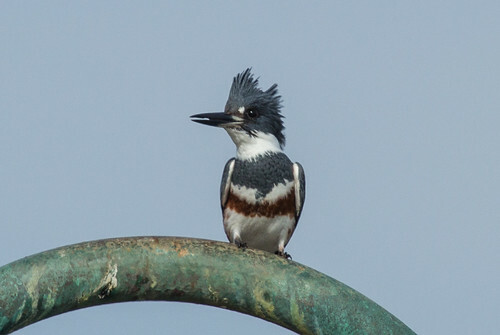 Ancient Greeks had never seen a Belted Kingfisher—they were looking at the Common Kingfisher of Europe. 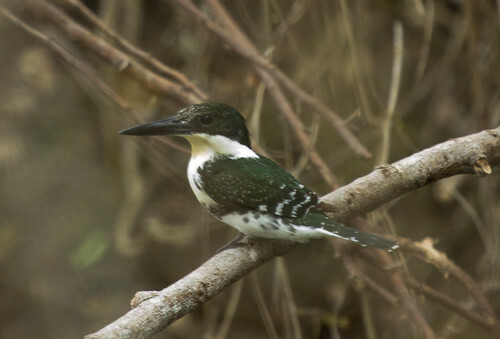 Current taxonomists argue about how closely the American kingfishers are related to the European species, and some place our kingfishers in a different family, but the current American Ornithologists’ Union checklist keeps the world’s kingfishers in the same family, putting our North and South American ones in a different subfamily than the ones on other continents. 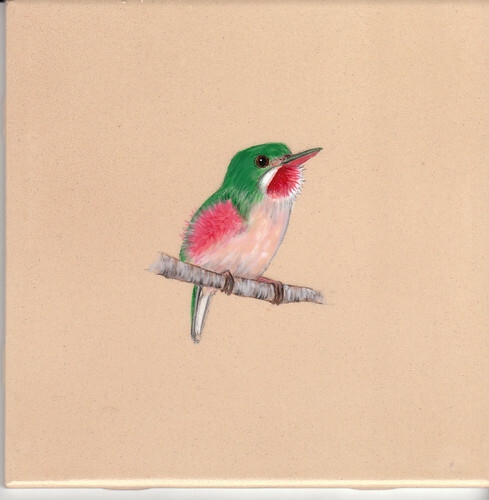 The one bird in the world I most yearn to see, the Cuban Tody, is related to kingfishers, belonging to the same order (Coraciiformes), but in a different family (Todidae). The Kingfisher's flight is remarkable for its beauty. How easily those long wings carry him about, as he skims so close over the water that their tips are sometimes wetted, or, as he hovers, his body appearing absolutely motionless, in that wonderful way which few birds can equal, for indefinite periods of time. Sometimes, especially in water half a foot or less in depth, he dives while flying nearly parallel to its surface. Sometimes, in his journeys from perch to perch when fish are plentiful, he dips again and again into the water in this way, reminding one of the Swallow as he gracefully touches the water here and there in his flight over the mill pond. Again, he drops like a falling stone in a nearly perpendicular line upon his fishy prey. Kingfishers are as secretive and protective about their best fishing holes as human anglers. 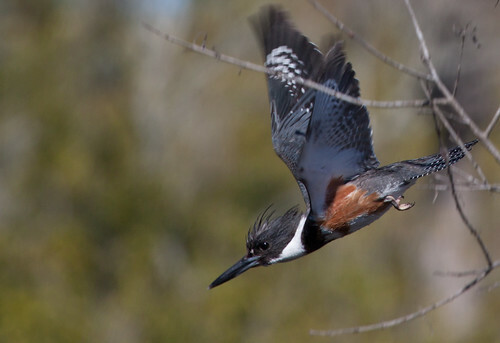 Accounts I've read, in Bent and many other sources, emphasize the dramatic chases that kingfishers engage in when defending a territory, and I’ve seen that a lot myself over the years. But I never happened to be in the right place at the right time to see a triumphant kingfisher return to his perch after one of these chases until Russ and I were on Jekyll Island in Georgia a couple of weeks ago. We must have been there right at the peak of fall migration for kingfishers, and my guess is that this one guy had found a perfect spot that he was planning on holding as a winter territory, but many of the birds passing through were also noticing how ideal it was. I don’t think I’ve ever been anywhere where so many kingfishers were contending for real estate before. The one who seemed to win these interchanges would alight on the same perch each time and continue to call loudly, facing whichever direction he’d chased off the last bird while opening his wings wide. His wings didn’t appear the least bit wet, so I suspect this was just his way of looking as big and bold as he could, like a macho 50s pop singer, in full chase, rattle, and brawl mode. The Birds of North America account for the Belted Kingfisher notes, in the communication section, that, “When threatened, kingfishers may scream, spread their wings, and raise their white eyespots.” So I’d hardly discovered anything new, but seeing and photographing it was thrilling nonetheless. Adult kingfishers often regurgitate pellets, so when a scientist locates a spot where a kingfisher sits to digest, it is both legal and fairly easy to work out the bird’s diet. (Researchers used to regularly shoot birds and slice them open to examine their stomach contents.) Thanks to the many studies on them, we know that kingfishers eat a lot of prey besides fish, including frogs, small crabs and crayfish, mice, baby quail and ducklings, and even some berries. They often fish from a perch, and their tiny feet allow them to sit on rather small twigs and wires when those give the best view of the water. They can also fly low over the water watching for food, or hover in place for many seconds watching the water below. After catching prey in their bill, they carry it to a perch and pound it over and over. This stuns the victim, serves to break off any fishy spines or the pincers of various crustaceans, and helps the kingfisher figure out which end is the head—that’s the end that will go down the hatch first. 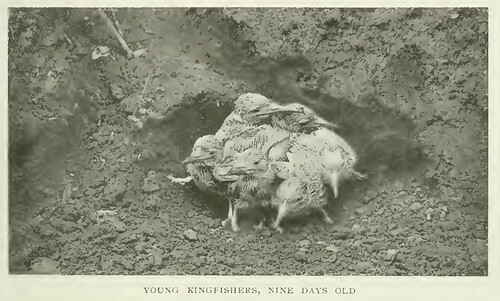 Interestingly, baby kingfishers can digest the bones and scales of fish, but lose this ability around the time they are ready to leave the nest. 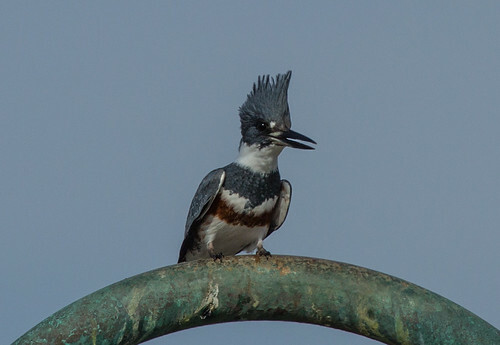 The vast majority of Belted Kingfishers nest in burrows excavated into shoreline banks, and also use ditches, road cuts, landfills, and sand or gravel pits. There even exist accounts of them nesting in holes in dead trees and stumps. A typical nest begins with a tunnel at least 30 inches long, and often longer. The tunnel usually slopes upward from the entrance, probably to reduce chances of the nest flooding. The nest chamber itself starts out not much wider than the tunnel, but the chicks enlarge it as they grow. The adults’ regurgitated pellets of fish bones and scales and other undigested items accumulate on the nest floor, providing a bit of insulation for the eggs and then chicks. 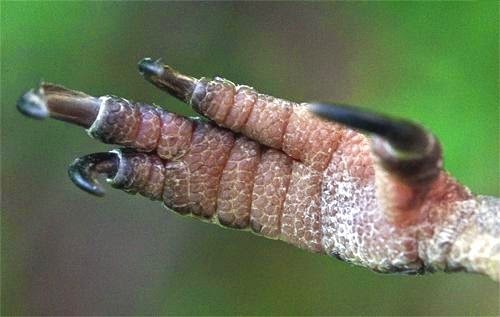 The weirdly tiny feet of kingfishers are unusual in another way, too—they’re syndactyl—that is, the outer toes are partially fused. 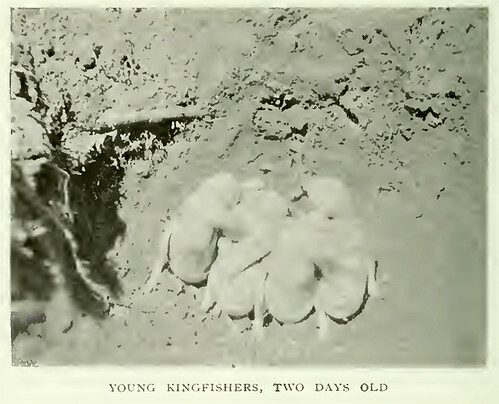 This foot design makes it pretty much impossible for kingfishers to walk—they shuffle in and out of their nest burrow, hardly shift foot position at all while perched, and otherwise move about by flying—but many ornithologists suggest that the foot design is perfect when the birds are excavating these burrows into sand banks. They use their massive bill to break up the soil and their thickened feet to shovel the loosened soil out the entrance. Photo courtesy of Bill Hilton, Jr. Copyright 2012. 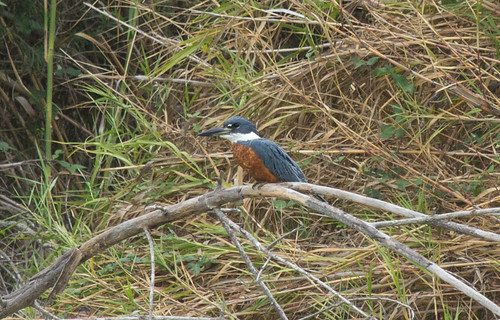 The above photo is from Bill Hilton, Jr.’s wonderful account about the Belted Kingfishers he’s studied at Hilton Pond. Read his entire post, and see his close-up photos of kingfishers in the hand, including one that shows its tiny vestigial tongue, here. This is a most sensible method of keeping warm, since the mother bird's legs are so short that she could not stand over them, but as they are protected from the wind and weather they have no need of her. Their appearance is comical in the extreme, and all out of proportion. This clinging to one another is apparently kept up for at least ten days, for a week later, when nine days old, they were found in exactly a similar position. Although very few ornithologists have ever observed this first hand, accounts of the ones who did all emphasize this peculiar habit of the chicks, clumping together like that. This time of year, kingfishers are all done with nesting and are focused on getting through the coming winter. They obviously can’t remain anywhere where they can’t obtain food, but some manage to survive extremely cold winters where they still have access to fish. Some are seen occasionally in mid-winter even in Wisconsin and Minnesota where running streams remain open, and they can survive frigid winters in places, such as Yellowstone, where hot springs keep shallow ponds open. Researchers haven’t done a lot of work tracking individuals to know what the survival rate is for these lingering birds, nor whether, if one disappears in January or February following extreme weather, it moved on or died. We don’t even know if the birds that overwinter further north get the edge on migrants in claiming and defending a good territory come spring. Some of our Belted Kingfishers winter throughout Mexico and Central America, but a great many—probably the bulk of them—are found throughout the central and southern states all winter. 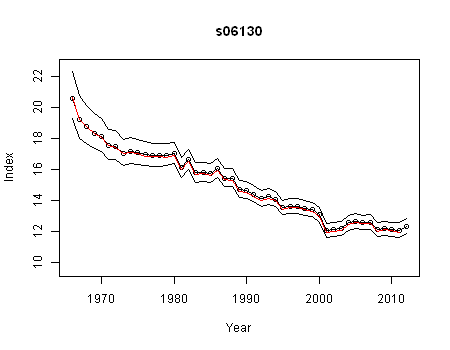 The Breeding Bird Survey shows that Belted Kingfisher numbers have very slowly declined since 1966. I love getting to spend time with kingfishers in Texas and Florida in mid-winter when they are most abundant. Unfortunately, even then they’re camera shy—I’ve taken bazillions of photos of them at a distance, but have a miserable time getting close enough for really great photos, and unlike Bill Hilton, Jr., I'm not a bander, so have never held one in my hands. That’s okay. Every encounter with kingfishers is fun and exciting even at a distance, and even after paying attention to them for almost 40 years, I’m still noticing and photographing new things about them. I expect I’ll be looking forward to seeing my next kingfisher as long as I live. Journalistic standards have fallen dramatically in recent decades, perhaps nowhere worse than on radio talk shows. Rush Limbaugh has managed to get around any expectation that he be held accountable for lying on the air by claiming to be no more than an "entertainer." But readers still seem to expect to find accurate facts in their newspapers. Whether one disagrees with conclusions about what to do about those facts, facts remain facts. We trust newspaper journalists and their editors to verify the accuracy of information presented as fact. Joe Soucheray plays a cranky old man on his radio program, "Garage Logic." Unfortunately, that cranky disregard for facts bleeds over into his work as a sports journalist for the St. Paul Pioneer Press. His utter disregard for facts in his recent column about the Vikings stadium's bird-killing glass should disqualify him from ever being taken seriously as a journalist. But how could the exceptionally sloppy "truthiness" have passed the Pioneer Press's editors? To have published such utter tripe is a shocking falling off from the standards that once earned this paper Pulitzer Prizes. We are being told, or asked to believe, by the Audubon Society, city council types and other defenders of birds that hundreds of millions of birds die each year after crashing into tall office buildings, apparently because they are confused by reflective glass. Hundreds of millions! Why, we should be wearing hip boots to work, if that is the case. 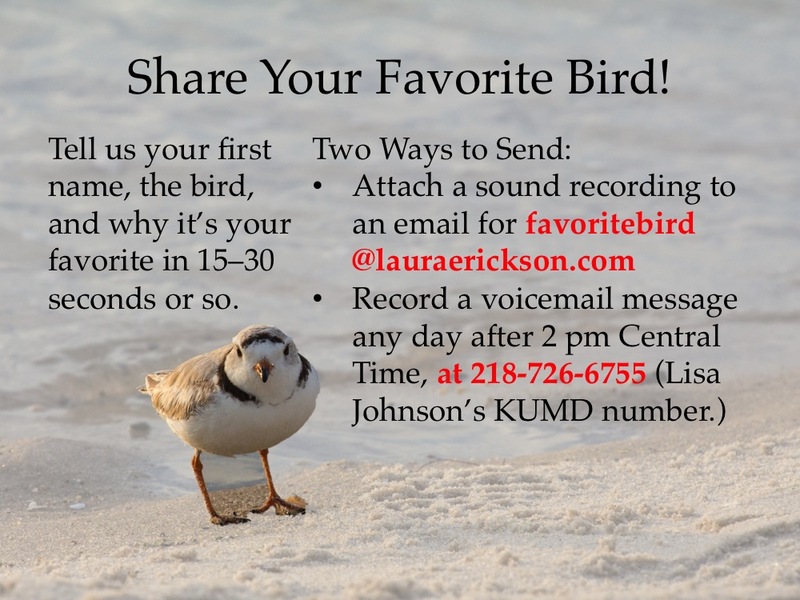 Audubon Minnesota and the Audubon Chapter of Minneapolis have indeed reported the fact, verified by the U.S. Fish and Wildlife Service and a great many researchers, that a huge number of birds are killed in collisions with windows in the United States every year. 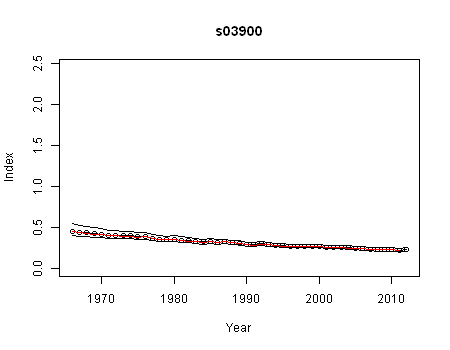 The figure 100 million is the most conservative estimate. The most recent research sets 500 million as a minimum, and the number may well be over a billion. A simple Google search would have provided plenty of solid evidence of the magnitude of window mortality, clear explanations of how the studies were performed, and even lots of photos of dead birds beneath windows right in downtown Minneapolis. The Vikings, the MSFA, and even Robert Zink, an ornithologist who claims the annual death total doesn't affect bird populations—none of them disputes the magnitude of bird deaths at windows. It's fact. Does that mean we really need to take out our hip boots to negotiate downtown Minneapolis? Let's assume every one of the 500 million birds colliding with windows is a Giant Canada Goose, a maximum of 4 feet long with a 5 foot wingspan (most are only 43 inches long with a smaller wingspan). So being really generous, let's say each goose falls completely stretched out, taking up 20 square feet. 500 million of them would thus cover an area of about 10 billion square feet. What a huge area! Get those hip boots! Oh, wait—10 billion square feet is just 359 square miles. 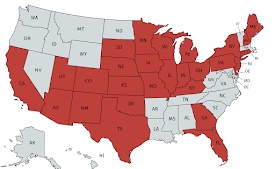 The U.S. Census puts the total area of the Twin Cities metropolitan area at 6,364 square miles. So if 100 percent of the birds killed at windows throughout the United States were all the largest possible Giant Canada Geese, and every one of them crashed to the ground in the Twin Cities metropolitan area, there'd still be plenty of open space to walk between the carcasses, hip boots unnecessary. And the truth is, Canada Geese virtually never hit windows. 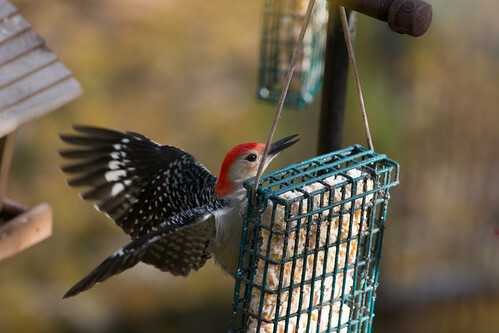 The birds that do mostly range in size from hummingbirds to robins. So let's assume they're all robins, 10 inches long with a 17-inch wingspan. 500 million of them would cover an area of 85 billion square inches, or 590 million square feet, or 21 square miles. St. Paul alone is 52 square miles, so there'd still be space to walk among all those dead birds. Of course, most of the dead birds are much tinier than robins--White-throated Sparrow, Ovenbird, and hummingbird size. The 170 square inches we're giving a robin could be covered by 3 Ovenbirds or White-throated Sparrows, or by 10 Ruby-throated Hummingbirds. Hyperbole seems to be the order of the day on talk radio, and Mr. Soucheray's "truthiness" is funny, right? For those who enjoy being entertained with falsehoods, this fits in with his radio rants. But his outright distortions of facts have no place in a legitimate newspaper. He's many decades past junior high math, and few journalists have a strong math background, but it took me five minutes using Wikipedia (to get the areas of the Twin Cities and St. Paul), an inexpensive bird field guide (to get the bird measurements) and a cheap calculator to work out the numbers. Is the St. Paul Pioneer Press that short on staff that they can't check such obvious errors? I've written columns and articles for the Wisconsin State-Journal and the Minneapolis Star-Tribune--there is no way either newspaper would have printed my work if I made up my facts out of whole cloth. How does Mr. Soucheray get a pass on meeting the most elementary of journalistic standards? There is probably no more evidence for a bird not crashing into cloudy glass than there is evidence that hundreds of millions of birds die each year crashing into tall office buildings. Again, he's questioning facts that are not in dispute by any of the interested parties in this issue; facts that are easily available with a Google search. The Vikings and the MSFA are not arguing that changing the glass won't reduce the kill. 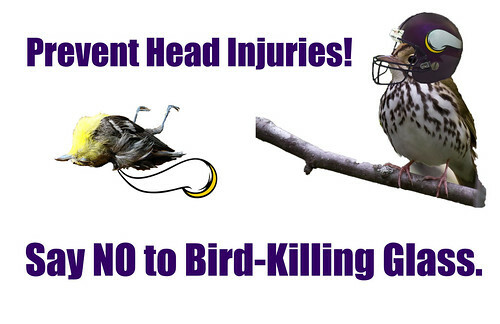 There are lots of studies affirming that the glass recommended by Audubon Minnesota and the Audubon Chapter of Minneapolis really does kill fewer birds. If Mr. Soucheray wants to argue that the higher mortality is justified by the feeling of being outdoors that some fans and football players may enjoy during 8 home games a season, or that the building plans are a wondrously aesthetic choice, or that saving hundreds or thousands of birds a year is not worth a million dollars, that would be his opinion based on his analysis of the facts. But no--he found it easier to simply claim there's "probably no more evidence" without doing the most rudimentary Google search to find out that, in fact, there is abundant evidence. He also didn't bother to look up "fritted" to understand the difference between fritted glass (clear glass with some patterning embedded) vs. "cloudy." Why let facts get in the way? The other morning I was reading the paper when I heard a thump. I knew exactly what it was. A little songbird crashed into one of my windows. It happens a few times a year, usually in the autumn, when I suppose the harsh, low-angle light of day is as problematic for a bird as it is for a golfer looking for his Titleist. In 25 years, I would say maybe a couple of dozen birds crashed into the house. Because I am very keen on urban wildlife, I pay attention to the numbers. Of the 26 or so birds that made contact with a window, I saw only two that required attention. And on both those occasions, I cupped the bird in my hand as the little musical notes played over the bird's head. He had been knocked out. But if you hold them until they come to, all you have to do is give them a good lift and they fly away. The thump the other morning? No bird. He didn't even get knocked out. Yes, it has been many decades since Mr. Soucheray took junior high math if he thinks that something that happens "a few times every year" would occur "maybe a couple of dozen" times in 25 years, or that "a couple dozen" equals 26. And even assuming "a few times a year" means two, that would amount to 50 collisions in 25 years. But let's give him the benefit of the doubt. Yes, in 25 years, just 26 birds have made contact with his windows. At least half of all bird collisions result in death--that's been well established by several researchers, and is not being disputed by anyone promoting the stadium design. Those "little headaches" Mr. Soucheray mentioned? He must not have read the news stories about how what seemed like a minor head injury from a skiing accident killed actress Natasha Richardson, nor about the horrible effects of "little headaches" on Vikings players--and they're wearing state-of-the-art protective helmets! Let's say Mr. Soucheray's house is average, and let's say the one bird that he noticed hit his house this year really was the only bird to hit his windows, and that one a year is normal. The US has about 125 million houses. (Again, Mr. Soucheray, Google is your friend.) So we're back to that over-a-hundred-million-bird figure, which doesn't even take into account the many thousands of dead birds picked up at apartment buildings, high rises, and other glassy downtown office buildings. I suspect that Mr. Soucheray would react to this critique of his column in the same way that some junior high students react to being called on their sloppy work, by rolling his eyes. But I wish at least one editor at the Pioneer Press expected staff writers to demonstrate even the most rudimentary research skills, and to know the difference between facts and lies or distortions. Without that, the paper has lost its integrity. Now that our huge warbler migration fall-out is over, life on Peabody Street is much less fraught. During the peak, I was getting several hundred White-throated Sparrows in my yard—now I have fewer than a dozen from day to day. Juncos and Fox Sparrows have supplanted the White-crowned and Harris’s Sparrows, and I haven’t noticed a Yellow-rumped Warbler, in my suet feeders or trees, in over a week. With an order of magnitude fewer birds, it’s a little quiet here, but there’s still plenty to look at. Back when things were still hopping, I started hearing a Red-bellied Woodpecker on and off, but other than noisily announcing his presence, he didn’t seem to want to reveal his whereabouts. But now for the past 10 days or so, he’s been coming out into the open several times a day. 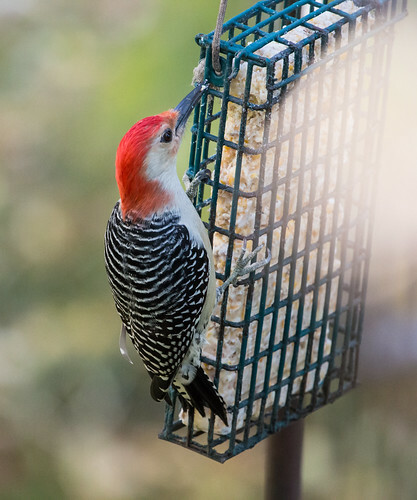 He pigs out at my suet and peanut butter feeders, and finishes up each visit with several trips to the tray feeder filled with sunflower seeds. 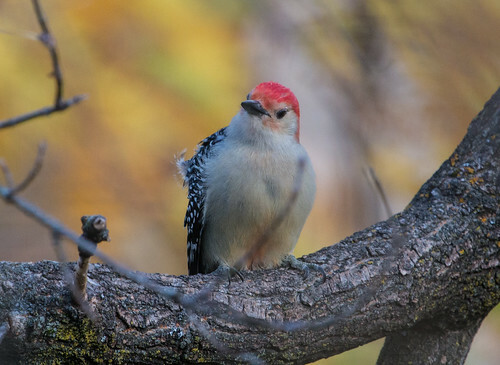 Red-bellied Woodpeckers don’t have a gular pouch—the throat pouch that Blue Jays fill with seeds to hide away—so he can only handle two or three in his bill at a time. He seems to be wedging them into crevices in the bark of trees in my yard and my neighbor’s yard. He’ll make a dozen or so trips doing this before he disappears for an hour or so. Hiding food around seems to indicate that this guy will spend the winter here. 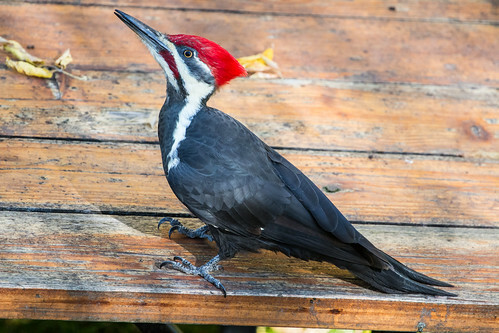 A male Pileated Woodpecker shows up every few days. He’s very inquisitive—one day he even alighted on my picnic table to check it out. I have an above-average number of squirrels in my yard again this year. It’s a problem, but we’ve finally succeeded in getting the bird feeders situated so the squirrels can’t jump in from the fence or trees, and Russ kept tweaking our squirrel guards until now none of the squirrels seem to be breaching them. But when I’m at work at my desk, one squirrel gives me long, hard stares. I’m pretty sure that’s the one who’d had mange or some other scurvy skin condition a couple of winters ago. I’d been looking out for her—tossing peanuts on the ground when she caught my attention—and so now she expects special treatment. When she shows up, I’ve been tossing whole peanuts out the window, and she rushes to the ground and grabs them. Unfortunately, several other squirrels figured this out, and since I’m a soft touch, I’ve been spending an inordinate amount of time at the window tossing peanuts to squirrels. 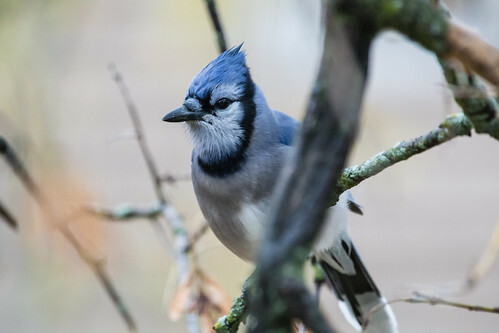 I didn’t have a huge Blue Jay presence in my yard this fall, though a few times I had over a dozen at once. They don’t seem to be passing through anymore. But one bird—he or she comes alone each time—started following the squirrels and digging up their peanuts. Then he started flying in to peanuts I was tossing on the ground. If I tossed out two or three, the jay always picked up one and carried it over by another one, then put down the first and picked up the second, and flew off with whichever one was heavier. But soon my squirrels started darting for him whenever he alights on the ground. I’m far more partial to a Blue Jay than to even the most endearing squirrel, but I couldn’t toss the peanuts anywhere where he was safe from marauding squirrels, so I started whistling and talking to him, and now when he arrives, now he gives me a long, hard stare or squawks. That's my signal to put a peanut on the roof of my one small window feeder—the one place the squirrels can’t get to. 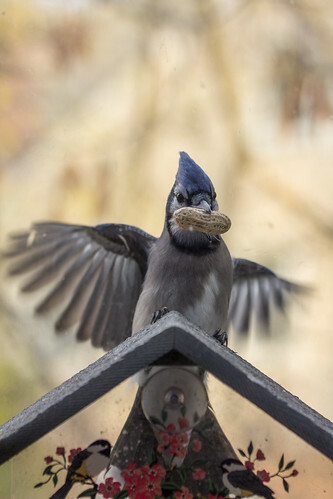 At first the jay was skittish and mistrustful, but now he flies in the moment the window is closed, grabs his peanut, and flies off to hide it somewhere across the street. Last weekend a pair of Blue Jays started chasing him and trying to steal them, but they apparently didn’t find Peabody Street—at least my corner of it—a suitable winter quarters, and I haven’t seen them in several days. Besides these special individuals, I have a couple of flocks of chickadees visiting regularly, including my beloved little one who’s missing its front toes. So I’m spending this late fall in pleasant company—Peabody Street’s very own Pickwick Club. Little Katherine. Photo by Michael Geraci. 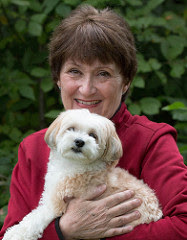 My daughter Katherine, who I still call Katie, lives in Brooklyn with her partner Michael and their sweet dog Muxy. 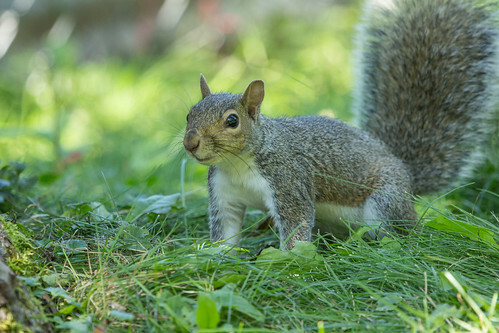 When Katie was walking Muxy one Sunday night a few weeks ago, she came upon a tiny squirrel in big trouble. The not-quite-weaned little thing was on the ground, not far from some rat poison, and blood was coming from its mouth and nose. Katie and I both suspected that it had eaten some of the poison, and knew time was of the essence in getting it help. When I was a wildlife rehabber, I never had to deal with victims of rat poison, and wasn’t sure what to tell Katie to do if she couldn’t get help that night. Here in Duluth, we now have a really good local rehab center, Wildwoods Rehabilitation Center, but I didn’t know much about what was available in the Big Apple. Katie had already had an interaction with the Wild Bird Fund, not far from Central Park, but this was a Sunday night, when the rehab center was closed and no one would be answering phones. But she knew that someone would be on site providing routine care and evening feedings until 8 pm, and because she and Michael are both kind and optimistic people, they decided to bring it there and ask what they should do. It was already after 7 pm, and since no one would be there after 8, public transportation was out of the question. So they took the squirrel for a taxi ride. If New York City is thought to be cold and impersonal, New York City cabbies have an even scarier reputation. Katie and Michael had the squirrel fairly well concealed, but at some point, the cabbie realized they were transporting wildlife. When they explained, he could have kicked them out or at least scolded them. Instead, he turned his meter off. It’s ever so easy to become jaded about the human race, but individual human beings can be far, far kinder than a cynic might expect. I have good news regarding little Katherine. While I was a little worried last night she is now doing much better and developed quite an appetite. She still has some trouble drinking but with the medication the swelling in her mouth is going down and she is feeling much better. She has two friends so far, both new arrivals. Little Katherine is doing fantastic. She is growing and gaining weight each day. She loves her new siblings, especially her best friend Florence. Though Katherine and her group belong to the youngest, I'm planning on letting them overwinter in "winter-camp" in the Berkshires. 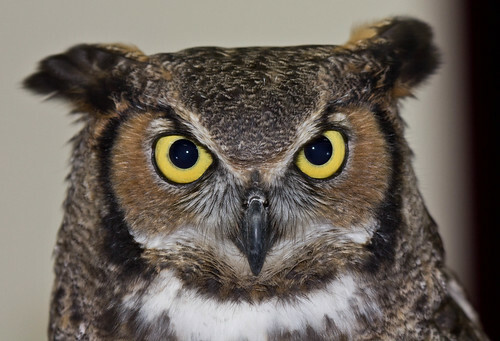 We work together with a bird sanctuary that has big outside enclosures that are empty during the winter. We can use them for the young squirrels who this way have several months to grow big and strong instead of fending for themselves through their first harsh winter. They do very well up there and then go free in spring. The doors will be left open and there will still be food inside so the squirrels can come and go, explore the woods and find their own territories in their own pace. A perfect scenario. I’ve had a few more squirrels than I should in my own yard, pigging out at our feeders. But there’s something impossibly endearing about them, especially baby squirrels, and something lovely about living on a planet where people do what we can to alleviate the suffering of even lowly little rodents. 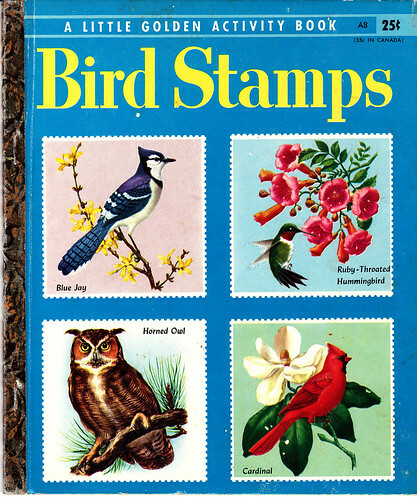 Bird Stamps included the only three species I knew personally from my own neighborhood: the Robin, Cardinal, and House Sparrow. The other 15 were nowhere to be seen in Northlake, the blue-collar suburb of Chicago where I lived, at least as far as I could tell. So for the most part, this was a book of tantalizing mysteries. When my family went to Lake Geneva, Wisconsin, when I was 5, I saw a Blue Jay, which I recognized from the book, and I was thrilled. I wondered if there were 14 other places where I could go to see the remaining ones. I left my Bird Stamp book on the swing set when I went in for my nap one day, and it rained that afternoon. We weren’t the kind of family who knew how to deal with this sort of damage, when the book was still at least somewhat salvageable, so although I could picture some of those 18 birds in my mind’s eye, my precious book was gone forever. Fifteen or so years later when I started birding, I couldn’t remember all the birds in the book, so didn’t know exactly when I finally saw all 18 species pictured in the book, but thanks to the miracle of the Internet and eBay, now I do. During my first spring of birding, spent in Lansing, Michigan and home in Chicago, I saw 10 of the 18 species: the Robin, Baltimore Oriole, Cardinal, House Sparrow, Blue Jay, Red-Wing, Red-Headed Woodpecker, Starling, Ring-Necked Pheasant, and Mallard. When summer rolled around, I took a field ornithology class in southern Michigan and added six more: the Meadowlark, Bobolink, Barn Swallow, Belted Kingfisher, Ruby-Throated Hummingbird, and Bluebird. The sheer richness of those first months of discovery, seeing 78 species for my lifelist between March 2 and the end of June, kept me in an almost constant state of euphoria. By year’s end, I’d seen 17 of the Bird Stamp species (adding Herring Gull in northern Wisconsin that fall), and on January 15, I added the last one, the Horned Owl. 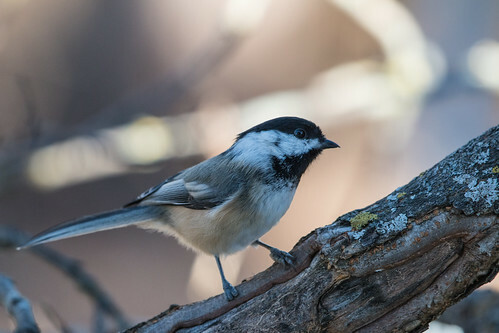 Appropriately, that was in Baker Woodlot on the Michigan State campus, the same place where I’d added my first bird, the Black-capped Chickadee (a species not in Bird Stamps), just 10 months earlier. In today’s digital world, children have access to a far richer wealth of full color and video images of just about anything in the world than I could have imagined in the 1950s. That rich source of information is a wonderful treasure, but I often worry about how drab real life might seem in comparison. 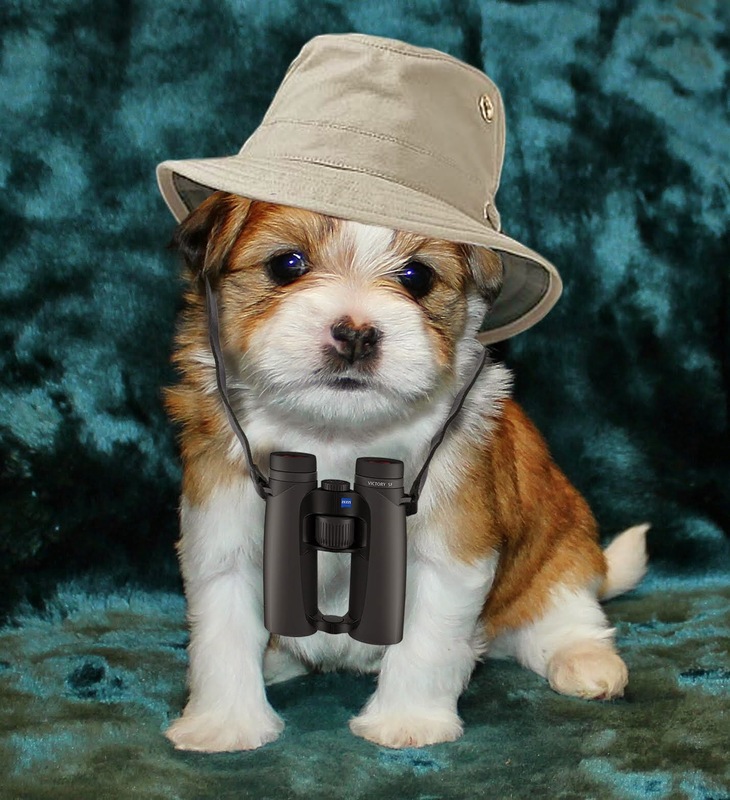 My father-in-law used to tease me that he could see birds way closer up, doing more interesting things, by sitting in his living room watching Marty Stauffer, than I could by going out birding. He didn’t really believe that, but I wonder how many children would rather look at Internet videos of pandas and polar bears, usually produced in zoos, than of real-life meadowlarks and bobolinks made in the wild? So much of the artwork of today adds a fake layer of cuteness and drama to real-life images of birds, setting up weirdly false expectations about nature. And even as the virtual world expands, the real world grows increasingly diminished: today some of the species in my golden book are far rarer than they were when I was a child. Nostalgia about my childhood makes the reality of the 1950s rather rose-tinted. On windy days, the sky was dotted with puffy blobs of soapsuds churned up where our polluted creek gushed through a dam. The DDT truck ran through our neighborhood on summer nights. 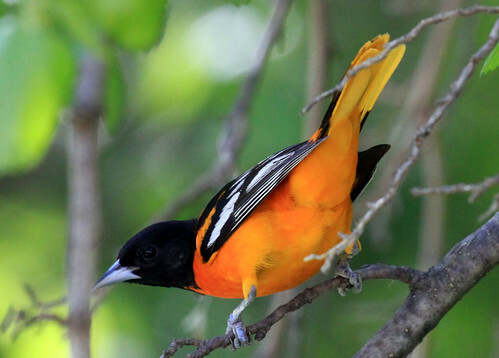 I did actually see a Baltimore Oriole once in my yard, but it was dead, the morning after one of those sprayings. This was hardly an idyllic world to reminisce about, and there is so much about today’s world worth celebrating. 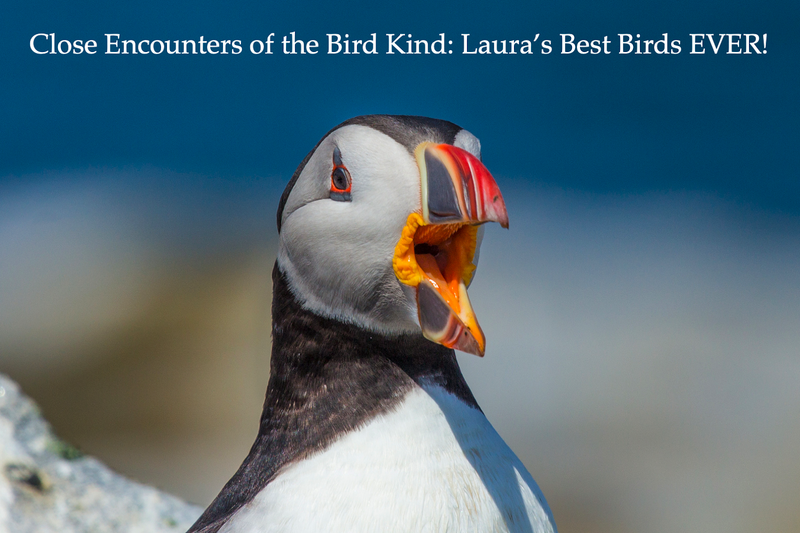 But I wish that everyone could experience at least one season filled with the joy of discovery that I had in 1975, when I saw so many of my first birds through eyes filled with a child’s elation and wonder. The more we appreciate this world’s real life treasures, the more likely it is that we’ll protect them so young people of the future will also be able to thrill at a glorious season of discovery. The Minneapolis Star Tribune just published an editorial about the proposed Vikings Stadium titled “Keep Bird Deaths in Perspective.” They write, “Altogether, fewer than 3 percent of the U.S. bird population dies each year from collisions with buildings,” as if 3 percent is insignificant. To put that in perspective, the two largest killers of the U.S. human population are heart disease and all forms of cancer, which, combined, kill less than 0.4 percent of us each year. That means that collisions with windows kill almost 10 times more of the bird population each year than our two biggest killers, combined, kill us. Insignificant? Of course, some species of birds have much higher rates of reproduction than we humans do, and other confounding factors complicate the picture, but most human mortality is concentrated on the oldest and weakest among us. 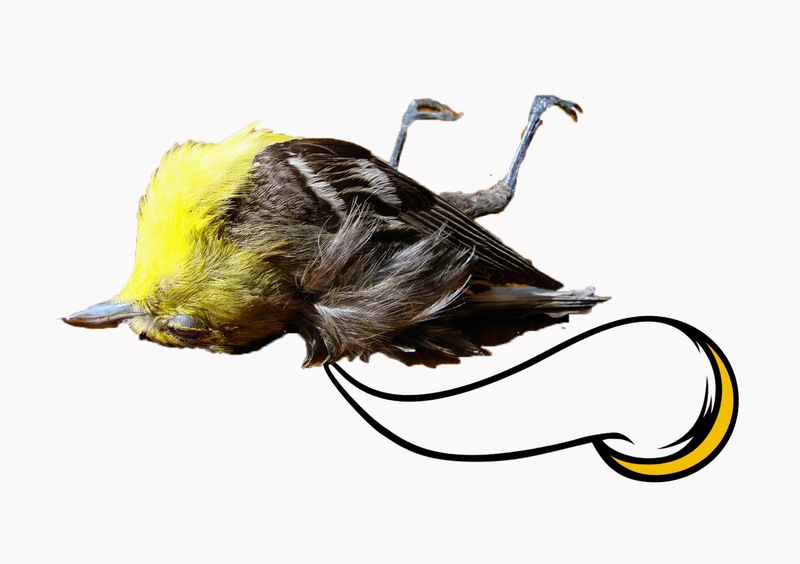 Collisions with windows are entirely random, taking out huge numbers of healthy young birds and adults in their prime as well as more fragile individuals. That still doesn't say exactly how the Vikings Stadium, with its almost 200,000 square feet of clear, bird-killing glass, would affect bird populations. It’s impossible to say, just as it’s impossible to say how many children would really die from lung cancer or heart disease if we were to lower the age for buying cigarettes to 6. In either case, people with any conscience know it’s worth something to prevent that needless potential mortality. The Star Tribune cites University of Minnesota ornithologist Robert Zink saying “People keeping their cats indoors would have a far greater impact on bird survival than whatever happens with the stadium.” Zink, the secondary author of a discredited paper about bird mortality at windows,* does have one thing right. Collisions with windows and predation by cats are indeed the two largest human-caused direct killers of wild birds, taking out, together, at least 6 percent of all American birds each year. Both causes of death are unacceptable and should be prevented whenever and wherever possible. Pesticides kill 72 million birds directly and many more over time. Power lines, communication towers, motor vehicles, wind turbines and bi-catch fishing operations take a big toll. Tree-cutting, swamp-draining and other habitat destruction is thought to be the biggest killer. Slaughterhouses kill 25 million chickens and turkeys. Cats, both domestic and feral, kill several times that many birds, more than a billion per year, by some estimates. I'm not exactly sure who on the Star Tribune staff thinks the deaths of farm poultry are relevant here (and that number is wildly inaccurate, to boot! 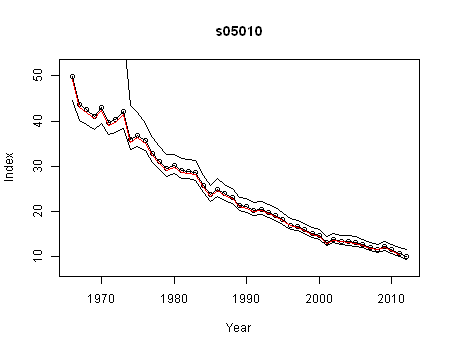 ), but we already know that too many things kill wild birds. 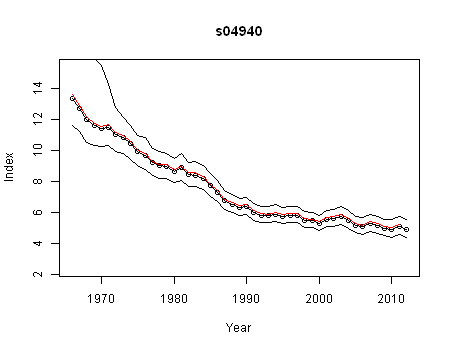 This year's State of the Birds reports on some very bleak outlooks. The Star Tribune editors and Robert Zink would apparently have us shrug and say, “Oh, well, what can we do?” I say the first thing we do is prevent the construction of brand new killers as we figure out how to reduce the death toll from the already existing ones. As a Minnesota taxpayer, I don’t like that any of my tax dollars are paying for a football stadium I will never ever use. But these decisions are made for the totality of Minnesotans, including some of my family members and friends who love the Vikings. Lots of factors went into the decision for public financing to cover half the cost of the stadium. I can accept that. But I sorely resent my tax dollars being used to pay for bird-killing glass that will not help the Minnesota Vikings in any way. Going forward with this misguided project will do nothing for football, but will simply prop up one architectural firm’s concept of aesthetics. 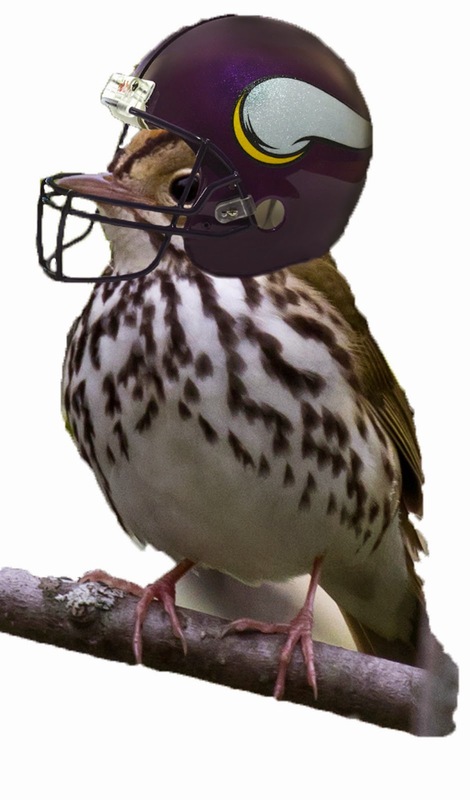 We do not have to make a choice between birds and football. We can have an aesthetic stadium without bird-killing glass—if one architectural firm is too lacking in creative skills to build it, the solution is the same as it would be in dealing with an incompetent football player: terminate the contract and find a better one. But speaking of contracts, 22 current Vikings players are each, individually, guaranteed to earn more than the one million dollars that changing the glass would cost. Christian Ponder, ranked at just #15 on the list of highest contract values, is guaranteed to be paid more than 10 times what changing the glass would cost. Adrian Peterson is guaranteed to make 36 times more and, if he serves his entire contract, 86 times as much as changing the glass. But it's not like switching to safer glass would come out of the players' pockets anyway: the budget for the stadium includes millions for cost overruns--money that would easily cover changing the glass. So yes, let's put this in perspective. The Minneapolis Star-Tribune says, “A wall of glass with huge pivot doors opening to a plaza and affording a clear skyline view, would add to the feeling of being outdoors.” Do they honestly believe that the feeling of being outdoors during an indoor football game is worth more than killing the very creatures that make being in the real outdoors so wonderful? If that feeling of being outside is so important, why not just build an old fashioned outdoor stadium? Oh, yeah--because football fans and players don't like the feeling of really being outdoors in Minnesota during football season. Building this stadium will kill birds year-round to give football fans, for less than forty hours a year, an utterly false "feeling of being outdoors." Where exactly is the perspective here? The editors end with “When controversial buildings are involved, bird collisions make for high drama. But they don’t amount to much in the larger scheme of things.” Just how much does the Star Tribune think “the feeling of being outdoors” during eight home games a year amounts to in the larger scheme of things? * Here are some sources refuting Zink's paper. If you know of even one peer-reviewed paper supporting his conclusions, please send me the citation! Otherwise I stand by my statement that his paper has been discredited. 3. 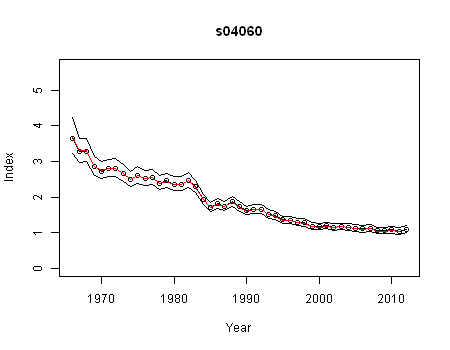 Bird–building collisions in the United States: Estimates of annual mortality and species vulnerability, Scott R. Loss, Tom Will, Sara S. Loss and Peter P. Marra. The Condor. February 2014. It will add 1/10 of 1% to the budget – think a couple of hundred dollars on a typical house – and will save energy. 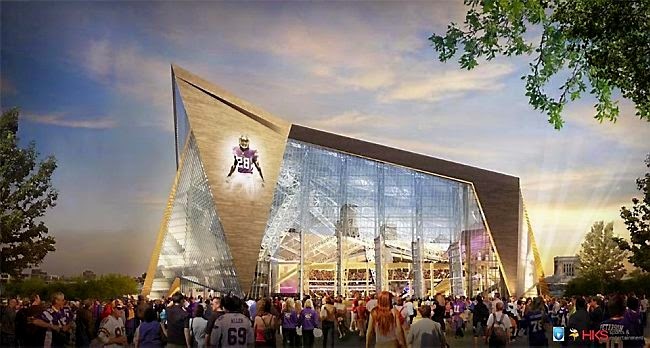 The Vikings have plunked down tens of millions on extra amenities, and there are construction contingency funds with way more than what would be needed. Audubon Minnesota has stated continually for over a year that the current glass is unacceptable and must be changed. Apparently the MSFA has recently agreed to some “lights out” policies that would reduce bird deaths at night, which is welcome, but this is totally separate from the choice of glass. 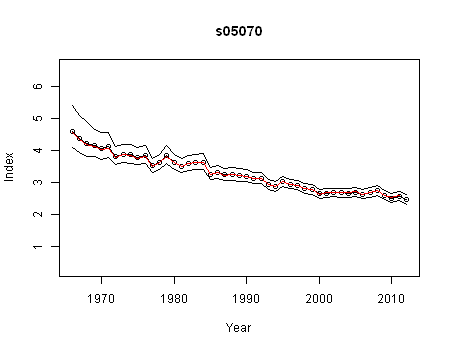 Here is link that shows dramatic decrease in bird fatalities.